Pat Blute brought the concept of South of Market: The Musical to a sold out house at Z Space in 2016 and is thrilled the show is back for V2. Blute started on-stage at the Cape Cod Theatre Company in many productions including the world premiere of The Phantom Tollbooth by Sheldon Harnick. His original musical SPEARS: The Gospel According to Britney was previewed at the Glicker-Milstein Theatre and in a preview at the Foxwoods Theatre, NYC. He has worked as a videographer in over 80+ countries after getting his start winning a free trip around the world from an online video contest. Pat is a Columbia graduate with a degree in Sustainable Development, a Varsity Showand Upright Citizens Brigade alumni in New York, and works at Ernst & Young on their Digital team. Pat started to give a TED Talk and has been featured in The Wall Street Journal, Worth, TIME, Buzzfeed, Spin, Los Angeles Times, National Geographic, as a Coca-Cola Scholar, and more. patblute.com. Sam O'Keefe is currently the Head of Startup Programs at Google Cloud. Previously, Sam was an Editor at TechCrunch where she managed the Startup Battlefield, the preeminent startup competition for seed stage companies and co-hosted TechCrunch Disrupt. Sam also launched Include, TechCrunch's diversity program, connecting underrepresented founders with top venture capitalist firms. Through TechCrunch, Sam served as a consultant for the first season of HBO's Silicon Valley. 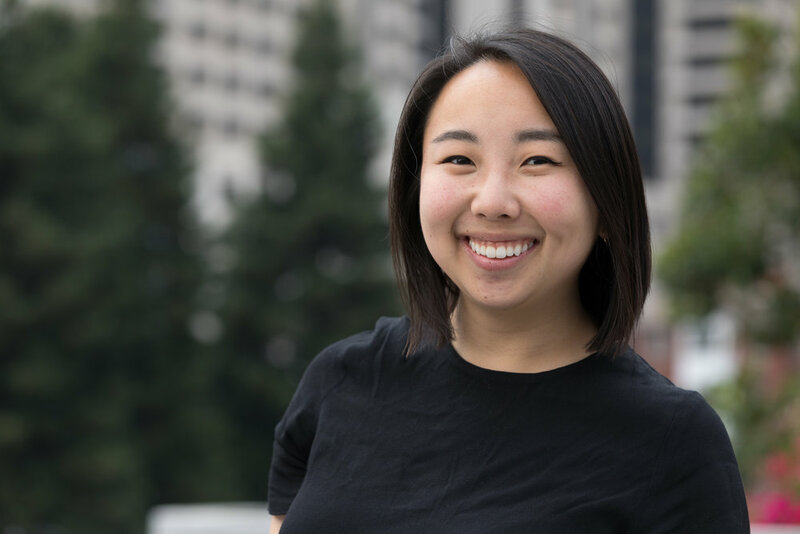 Sam considers herself to be a recovering founder, having started MicroEval, an enterprise software company, and participated in Y-Combinator S12. In addition to her roles in tech, Sam first joined the team of South of Market: The Musical in its inaugural production in 2016 as a co-writer and producer with Pat Blute. Sam serves on the Board of Trustees for the Massachusetts Institute of Technology where she received both her BS and MS degrees. She also is a Global Shaper, an initiative of the World Economic Forum. Tareq Abuissa is returning as composer-lyricist and music director, involved in every stage from script to performances. Scoring credits include four musicals, an indie album as Ruby Jubilee, two video series for Lincoln Center, three Animation thesis films at the University of Southern California, a Dance thesis at Barnard College, and several works of chamber music. A lifelong multi-instrumentalist, he has performed as a cellist Off-Broadway and as South of Market's bass guitarist. While studying Music and Mathematics at Columbia University, he co-composed The 118th Annual Varsity Show, and his composition mentors have included Fred Lerdahl and Osvaldo Golijov. A member of the Society of Composers and Lyricists, Abuissa's music can be heard at tareq.abuissa.net. Jason Scott is a proud nerd at heart, Jason Scott graduated from MIT in 2010 with a B.S in Biological Sciences and minor in Humanities. He later received his MBA from Stanford’s Graduate School of Business in 2016. Throughout his professional career, Jason has worked in management consulting, venture capital, and for a number of startups in and outside of the Bay Area. In addition to his immense love for dance performance and instruction, building community has been an ongoing passion in Jason’s personal, academic, and professional lives. Today, he continues to pursue this in a few ways: as founder of FactionSF, an events-driven network of talented and passionate young influencers within the Bay Area; as an employee at the early-stage travel startup, Remote Year, which aims to nurture greater empathy by making it easier for people to travel across the world; and, finally, by serving as an early-stage investor at a consumer-focused venture capital fund with the goal of promoting mission-driven entrepreneurship. Noelle Viñas moved from the DC Area to SF in 2015 with the magical idea that she could uniquely crack how to better integrate tech and theater folks as community members in the form of an audience. She’s still working on that. In the past year, she co-directed and co-wrote the original play Apocalypse, Please with her partner-in-crime Kevin Vincenti, which closed this past April to a nearly sold-out run at PianoFight. Beforehand, she led the theatre department at Annandale High School alongside Theater Without Borders, an NEA-sponsored program for ESOL students. An Emerson College alumna, she was a Creative Producer with ArtsEmerson, as well as an Allen Lee Hughes Community Engagement Fellow and teaching artist at Arena Stage. Most recently, she assistant directed Chris Chen's You Mean to Do Me Harm at SF Playhouse. She's currently a resident playwright at Playwrights Foundation, a company member with Ubuntu Theater Project, and a recurrent freelance producer at PianoFight. UP NEXT: Acting/singing as "Katchen" in The Black Rider with Shotgun Players as directed by Mark Jackson this November-January, followed by writing and directing La Profesora, a one-woman show about the Uruguayan dictatorship starring Virginia Blanco at TheatreFirst. Jenny Arimoto grew up many miles away from this theater (20.3 miles to be exact) in San Mateo where she experienced firsthand the Bay Area's transformation into the home of tech and overpriced drip coffee. Despite many threats to her parents about leaving behind the Bay Area, Jenny graduated from UC Berkeley in 2013 with dual degrees in Political Science and Media Studies, and a minor in Japanese Language. After college, she was wooed by the tech world and the promise of free lunches. Jenny currently works in ads and eats too many kale chips in the microkitchens at Google. When she's not thinking about Google Shopping Ads, you can find Jenny running around and doing her go-to valley girl character on stage with SoMa co-writer John Russell and their team JACKSON at Endgames Improv. 100 Tricks to Appear Smart in Meetings, was published October 2016 by Andrews McMeel. Sarah lives with her husband Jeff in San Francisco and enjoys stand-up comedy, 90s rock, and both sunny and cloudy days equally. John Russell is the product of a childhood fired in the kiln of Phoenix Arizona, which, combined with a homeschool education and specialized survival training, has rendered him uniquely suited to rule over an underdeveloped but politically important desert planet. In the meantime, John works in account management at ad tech company AdRoll. He is also co-founder of indie game studio Bad Omen Games, where he co-developed a board game recognized by peer designers last year for excellence in design. John graduated Pomona College in 2013 with a degree in economics and trained as an improviser at the Upright Citizens' Brigade (in NY & LA) as well as SF's Endgames Improv. You can find John and SoMa co-writer Jenny Arimoto performing together with Endgames company team JACKSON.